This descriptive, narrative nonfiction text will grip readers from the first page. The engaging text couple with magnificent close-up, oil illustrations capture the mystery and beauty of the elusive giant squid. So big, yet rarely seen. Instead, they are rarely glimpsed"
Near the end of the book fold-out pages illustrate the full body of giant squid. By the next page, the squid has vanished. A diagram provides readers with information about the squid's body and survival techniques. Don't miss the author's note and list of online sources in the back matter. 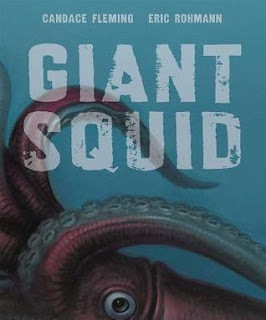 Read aloud Giant Squid as an example of science writing; it's both poetic and informative. Visit the author's website to download a science guide. A very cool book! Really enjoyed it! Such amazing creatures.